Yes, it's come to this, and it feels bittersweet. Today's 19.6 mile hike brings me to within 5 trail miles of the 'finish line'. So all that I have left is to hike a short leg tomorrow setting up a 'ceremonial' stroll to the finish line in Caledonia State Park - a stroll short enough that my family can do it with me. Wow ... I can't believe it's really the end ... and just in time to let nasty old Hurricane Sandy do her thing. 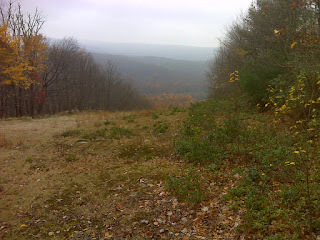 Today's hike took place in mild, cloudy, hazy conditions. I passed no viewpoints except this one from a pipeline clearing, but any views today were hazy ones. Otherwise I walked mostly very easy trail through woods that have quickly become full of naked trees. The leaf change and drop is mostly over. It is always so quick to come and go, but somehow seems especially quick this year for me. You've been a wonderful cyber friend and I will never forget you, Peter. Much love and please take care of yourself.